athaxto has no other items for sale. 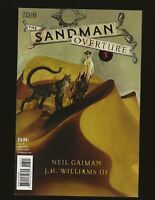 Sandman Overture #4 Variant Neil Gaiman RARE!!! CGC 9.6 SANDMAN #39 .. NEIL GAIMAN .. DAVE MCKEAN COVER ..
VERTIGO PREVIEW #1 (1993) VERTIGO ORIGINAL EXCLUSIVE SANDMAN NEIL GAIMAN STORY! VENOM #150 CGC 9.8 MATTINA SET OF THREE SKETCH VARIANT AND VIRGIN!!! NICE TRIO!